→912 vs 921 Bulb – Which Is Best for Your RV? 912 vs 921 Bulb – Which Is Best for Your RV? Every choice that has an impact on your RV can demand some serious consideration; this goes from the interior upholstery to even the choice of light bulbs. When it comes to the RV, there are two types of bulbs that are popular, more specifically the 912 and the 921 bulb. Still doubting between these bulbs? Check out our top facts below to find out more! What Is the Difference Between a 912 and 921 Bulb? There are some subtle differences between the 912 and 921; this relates to affordability, availability, and functionality. For example, most RV owners will find it easier to get a hold of a 921 bulb, since they are remarkably common. RV owners who choose the 912 will only have an LED option, which could turn out more energy-efficient. Polarity sensitivity can be a problem for the 912 though, so if you do choose this lamp and it does not work immediately, be sure to turn the bulb 180 degrees and reinsert it to make it work. Overall, the 921 can be a more reliable choice and most RV owners are most familiar with this type of bulb. However, RV owners who want to go towards the more modern and the more energy-efficient route should certainly consider the 912. Why Do Most RV Owners Start to Switch from 921 to 912 Bulbs? The 921 bulb is an incandescent light, so RV owners can expect the properties of an incandescent light to when they use these lights in their RV. So, let us explain the details on the incandescent light and why an LED version such as the 912 could be a better solution. An incandescent light such as a 921 bulb works with a filament inside the light bulb. The filament inside the light bulb does not only radiate light, it also creates heat. In fact, one of the characteristics of an incandescent light is that they can get exceptionally hot. Not only does that become a little bothersome in smaller RV’s, it is also a huge waste in energy. Therefore, many RV owners contemplate the switch to LED. Why Is an LED Light More Beneficial for an RV? Incandescent lights work very differently from LED lights. An LED light is completely based on a microscopic structure. When electricity enters the structure, electrons inside of the light start moving; this causes them to create a light photon. One of the biggest benefits of an LED light is that it does not create the heat an incandescent light does. Since the LED light does not contain a filament, but uses jumping electrons, an LED light such as the 912 does not waste the energy like an incandescent light does. Is There a Difference in Light Color Between the 921 and the 912? There can be quite a major difference between the light color of the 921 and the 912. The explanation is straightforward though. Incandescent lights tend to have a warmer white color; this due to the filament creating the light. However, electrons inside LED lights create a brighter white. If you like your RV cozy, you might not appreciate the brightness of the LED light. However, brighter lights do provide better illumination, so you do not have to worry about an area of your RV being too dark. In conclusion, there are loads of pros and cons with every type of light bulb, so it usually comes down to the benefits you appreciate most. If you prefer energy-efficiency, then the 912 might be best. However, if you prefer warmer light opposed to brighter light, you may want to stick with the 921. Voltage: DC 12V; package: 20 piece t10 42 SMD LED Bulbs. LED Color: Warm White, Dimension: 10mm(0.40") X 17mm(0.67"), Life time: 50000h+. Cross Reference: 921 912 906 168 192 W5W T10 T15 . Application: High Mount Stop Light ,also use for Backup Reverse Lights, Interior (Map, Dome, Trunk...) License Plate Light, Parking Light, Corner Light, Side Marker Light, Tail Light, etc. Common use for Car, Truck, Motorcycle, Boat, RV, Trailer, etc. .
Notice: For DC 12 volts Do not place in rain or water area Use this LED light with traffic law. 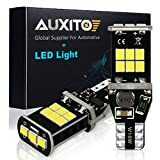 (Pack of 2) LED replacement bulbs,6W each bulb powered by 15 pcs high quality 2835 SMD LED lights.NOTE:These bulbs are not compatible with Chevy Malibu vehicles. Wide voltage:12-16V;Current:500Ma;Bulb size: 9*15*40mm; Net Weight:6g/pc. Brightness:3 times Brighter than original reverse light bulbs. Suit for socket : T15, 912, 921, 906, 904, 902, W16W, just plug and play without modification.ONLY used for backup reverse lights. AUXITO offer 12 months warranty on item(s) damaged during the shipping or confirmed to be a manufactory defect. 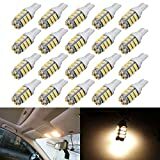 Friendly customer service responses within 24 hours during the business days.NOTE:Amazon filter system may not be 100% accurate, The bulb size may vary between trim of your vehicle. Please double check owners manual or original bulb size to confirm before placing an order. Camper Shower Curtain Track: Which is the Best One to Get?